Samsung is leaving no stone unturned as it seeks to pull simultaneous punches at Apple and other competitors in the Tablet market. Its latest Tablet offering called Galaxy Tab 7.7 is already up for pre-order on online sites like MobileCityOnline, although the site mentions that there is no estimated time of arrival (ETA) for the Tablet as of now. The new product further expands the already expanded (pun intended) range of Tablets under Samsung. 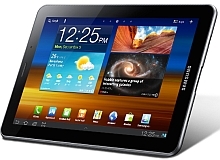 The company had recently introduced Galaxy Tab 730 (also called Galaxy Tab 8.9) in the Indian market and had earlier launched big brother Galaxy Tab 750 (also called Galaxy Tab 10.1). All three Tablets run on the Android operating system (OS) and while the Galaxy Tab 750 and Galaxy Tab 730 are available for Rs 34,000 and Rs 30,900 respectively, the 16GB version of the Galaxy Tab 7.7 is priced at $700 (approx Rs 36,050) in the US market. An Indian launch date and price of the Tablet are not available as of now. The Tablet has a 7.7inch SUPER AMOLED Plus (1280Ã—800pixel resolution) capacitive touchscreen display (the company claims this is the first Tablet to have a SUPER AMOLED Plus display) with 197 pixels per inch density (ppi) and runs on the Android 3.2 Honeycomb OS (with Samsung's TouchWiz UX user interface). It is powered by a 1.4GHz dual-core processor and has 1GB of RAM. Users have the option of selecting between models with 16GB, 32GB and 64GB of internal memory which can be further expanded an additional 32GB with microSD card. The Tablet has a 3 mega pixel auto focus rear camera with LED flash that can also record high definition videos (720p) and a 2 mega pixel front facing camera for video calling. On the connectivity front, the Tablet has Bluetooth v3.0, Wi-Fi (with Wi-Fi Direct) and 3G and it also comes with a USB 2.0 port. Additionally, the Tablet comes with pre-installed Google apps, Polaris Office (users can create or edit PowerPoint, Word and Excel documents) and supports Flash. All the Samsung Hubs like Social Hub that integrates messaging of E-mail, IM and SNS (social networking service); Music Hub for searching, downloading and listening to music; Readers Hub that has over 2.3 million e-books, 2,000 newspapers, and 3,000 magazines in up to 49 languages; and Game Hub which enables users to download high quality games have also been included in the device and the dimensions of the Tablet are 196.7mm x 133mm x 7.89mm and its weight is 340 grams. Samsung has provided a 5100mAh battery in the Tablet that the company claims will provide up to 10 hours of video, 50 hours of music and 1,500 (2G) and 1,200 (3G) hours of stand-by time. If we consider the price at which the Tablet is available in the US (and if its launched at same dollar price in India), its competitors in India will include Acer's Iconia W500 (Rs 31,990), Apple's iPad 2 (starting from Rs 29,500), BlackBerry Playbook (Rs 32,990), Motorola XOOM 2 and XOOM 2 Media Edition (price not available) and HTC Flyer (Rs 36,900). The Tablet will also compete with both its predecessors Galaxy Tab 750 (Rs 34,000) and Galaxy Tab 730 (Rs 30,900) for market dominance. The Tablet scores brownie points as far as look and specifications are concerned. Its processor is more powerful (at least on paper) compared to both its predecessors and the popular iPad 2 from Apple and even in terms of screen resolution and ppi density (197ppi in comparison to iPad 2's 132ppi); it has the upper hand with its SUPER AMOLED Plus display. Also, the Tablets voice call function has been upgraded and now users can make and receive calls privately by using Receiver Mode in public places (without the need of a headset or Bluetooth device for voice calls). There is no doubt that the pricing is a bit on the higher side, but considering the features of the tablet and the fact that competing brands prices all lie in the same price bracket, one can definitely consider buying the Tablet. Or if you are willing to wait another 6 months, maybe Samsung will launch its own quad-core Tablet offering like competitor ASUS has in the form of the Eee Pad Transformer Prime.